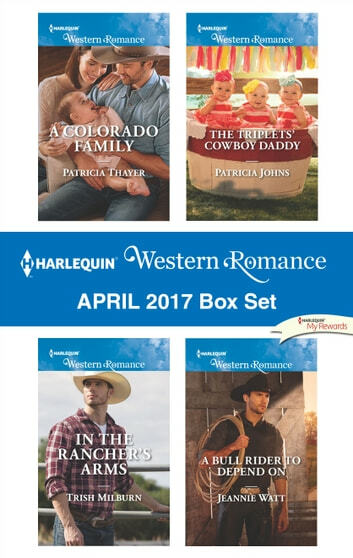 Nurse Erin Carlton agrees to help champion bull rider Austin Brannigan return to the rodeo—but when Austin unexpectedly discovers he’s a father, Erin can’t help but fall for him and his baby! Journalist Arden Wilkes has returned to her hometown after a harrowing incident overseas. Rancher Neil Hartley falls for her beauty and strength, but when Arden fully recovers, will she leave Blue Falls—and Neil—behind? Easton Ross was always there for Nora Carpenter, but she left Hope, Montana, and never looked back. Now she’s home with three adorable newborns, and Easton is in trouble—he’s falling for her all over again. Bull rider Tyler Hayward has left his bad boy image behind, but Skye Larkin disagrees! Now that they’re rebuilding her ranch together, Ty can show her he’s not the man she thinks he is…if she’ll let him.